To embody or pay tribute? Toronto's June Callwood Park Design Competition, organized in 2008, was an exercise in the redevelopment of a public community space, relaying June Callwood's philosophy as well as dedicating the new park to her. The death in 2007 of this journalist, fervent activist, and militant of social justice left the Torontonian community grieving. The decision to honour her became the central theme of the design competition. June Callwood Park is part of a series of design competitions that target revaluing the area as well as evolving the Toronto cityscape. Can a park both embody and honour the ideas of such a personality? The chosen site is 4000 square meters at the intersection of Fleet and Bathurst streets, adjacent to Fort York (itself the object of a design competition in 2009) and near the Waterfront area (the object of a series of competitions starting in 2006: the Central Waterfront Design Competition, 2006, the East Bayfront - Jarvis Slip Design Competition, 2007, the Lower Don Lands Design Competition, 2007, for more information see www.waterfrontoronto.ca). This part of the city is in an intense, but ongoing, process of redefinition, in search of a new identity after many years of neglect. The organizers made a series of ‘program suggestions' for the park. These include “the flexibility of the program, and the ability to modify the program as it moves forward. There must be creative and interactive play spaces for children and multi-functional sculptural and architectural water features. More than an open and permeable park with links to the surrounding community, June Callwood Park must recognize the role of historic Fort York, and be sheltered from extreme weather changes in summer and winter. Last but not least, the park must create a strong statement about the exceptional life of June Callwood.” All in all, it is natural to ask ourselves how the proposals were able to integrate so many injunctions and constraints. 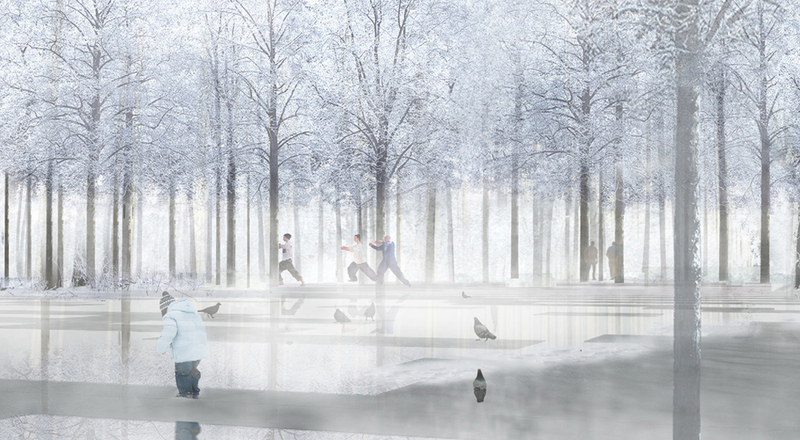 The four teams selected for the competition presented different visions for the generally linear, park. Some proposals adopted a more ecological approach, whereas others relied on an interpretation of June Callwood's philosophy. Gh3's winning proposal did not hesitate to draw from a voice sampling from June Callwood's final interview. Her words, “I believe in kindness”, became the central element of the project. The park is organized through the geometrization and realization of the voice sampling, giving birth to the promenade. According to the designers, the sound waves “[create] the abstract geometric pattern of openings and clearings within the dense groves of the Super-Real Forest” with a winding road through the park linking the clearings. These clearings encourage unrestricted play, all the while serving particular functions and the interactive promenade invites the user to make use of the spaces for a varied experience. In Janet Rosenberg + Associates' project, the circle is used as a symbol of June Callwood's philosophy. It evokes, at the risk of oversimplification, how “one act can radiate through the community”. The circular areas are integrated into the middle of the circulation axis, each with their own planned program encouraging community exchange. The project is truly a staging of spaces, intended to highlight these circular areas, visible from all points of the promenade. Balmori & Associates' project, in collaboration with du Toit Allsopp Hillier, presents “a simple articulation of the Fort York – Lake Ontario axis” linking the important parts of the area. The fact is that the projects seem to present a linear circulation within a creased landscape, without any particular planning. This land art advocates more of a promenade through rather than an interaction with the park. Their attempt at programming the spaces is difficult to grasp from the renderings, with the exception of a public space for events. They place more of an emphasis on the ecologic aspect of the proposal, implementing a greenery strategy that aims to protect the site from dominant winds. In a nod to Callwood, this strategy includes her favorite childhood trees: maple and cherry… all in all, quite the subtle nod. Finally, PMA Landscape Architects' proposal in collaboration with Ground further develops the ecologic aspect with the desire to ensure the health and vitality of the community. The park offers Torontonians a break from their stressful and hectic everyday lives, a place where neighbors and families can build bonds through social commitment. The unifying element in the proposal is agriculture. A grid superimposed on the site determines different plots within distinct agricultural zones. This vision seems quite utopian for an urban park, seeing as user interest may be difficult to provoke. However, if we consider Châteaufort community garden in Montreal, at the corner of avenues Van Horne and Darlington, it is not impossible to imagine that this type of system can be not only well received but even in demand by the community. While seeking a balance between the qualities required by this tribute to June Callwood, the jury declared it was “very supportive of the voice wave form taken from June Callwood's last interview and its articulation into the ground plane as a subtle organizing element. This overall organizing element and the ‘urban forest' design idea were graphically communicated very powerfully and resulted in an exciting scheme.” While the ‘urban forest' was convincing with regards to solar and wind strategies, this didn't stop the jury from making a long list of recommendations to improve the winning project. This type of competition, paved with good intentions, requires designers to bet on the level of expectations to be met all the while avoiding expected ideas, which is quite the bet! June Callwood Park is a 0.4 hectare space, located at the foot of the historic Fort York area of Toronto, to be designed and developed as a new park and significant addition to the public realm of the Central Waterfront. Situated northwest of the Fleet Street and Bathurst Street intersections, it will serve as the central public space for local citizens. June Callwood Park is to be a unique and dynamic outdoor space capable of performing a range of design and program objectives while serving the local and greater communities. While this park is to be designed for use by everyone, there will be a focus on the very young (a specific interest for the park expressed by Ms. Callwood). There is an opportunity for innovative, multi-functional elements that serve both an artistic and recreational function. - Stakeholder input and community consultation will be used to modify the program as it moves forward. - Play space for young children  creative and interactive play for toddlers to early school-age. - Water feature  multi-functional sculptural/ architectural and child's waterplay. - Passive open space  unstructured play space. - Landscaped areas  potential space for children to interact in a dedicated space. - Seating areas  for passive use, as well as linked to play spaces for care-givers to sit while young children play. - Links and connections  to adjacent community and open spaces. - Heritage interpretation  recognition of role of historic Fort York. - Environmental protection  design protection from the extreme winter weather elements and from the sun. - Public Art  to create a strong statement about the exceptional life of June Callwood. In 2008, a two stage design competition was administered by the Parks, Forestry and Recreation Division, with input from the June Callwood Park Steering Committee, to request design submissions from local and international landscape architecture firms with a commitment to design excellence, and a proven ability to design and develop high quality urban parks. During Stage 1, qualified landscape architectural firms were invited to submit a proposal through the Request for Expressions of Interest (REOI) process. During Stage 2, the short-listed teams received a competition brief in the form of a Request for Proposals (RFP), outlining submission requirements and providing additional material required to develop conceptual designs. Upon approval, the winning team will be retained to complete detailed design and construction documents for June Callwood Park. The Culture Division will be administering a public art competition for an art installation in June Callwood Park. This process will follow slightly behind the park design competition, so that the Landscape Architecture consultant team will be in place to participate in the selection panel for the public art competition. A Competition Jury was formed and made responsible for recommending a winning scheme from the Stage 2 (RFP) submissions to the City of Toronto. The Competition Jury included six members, chosen based upon their experience and knowledge of issues such as: landscape and ecological design, architectural design, local area, and the life and work of June Callwood. Each of the submissions was publicly exhibited at Fort York and at Metro Hall. A summary of the comments received by the public during the exhibition was provided to the Competition Jury, as well as a review of the submissions undertaken by a City staff technical advisory committee. (25 février 2009). June Callwood Park, World Architecture News. Repéré à http://www.worldarchitecturenews.com/index.php?fuseaction=wanappln.projectview&upload_id=11144. (Mars 2009). GH3 winner of the June Callwood Park international design competition, Canadian Architect, 54 (3), p.11. Texte intégral disponible en ligne : http://www.canadianarchitect.com/news/gh3-announced-as-winner-of-the-june-callwood-park-international-design-competition/1000090465/. (Avril 2009). A Park Designed with Sound Waves, June Callwood Park. Space, 497, p. 14. Patterson, Brenda. (18 décembre 2008). Outcome of June Callwood Park Design Competition and Award of Contract to Winner, Parks, Forestry and Recreation. Repéré à http://www.toronto.ca/parks/projects/June_Callwood_Park/backgroundfile-18096.pdf. Public Art Office Toronto Cultural Services. (2009). Call to Artists for Expression of Interest, City of Toronto. Repéré à http://www.toronto.ca/parks/projects/June_Callwood_Park/calltoArtists.pdf.